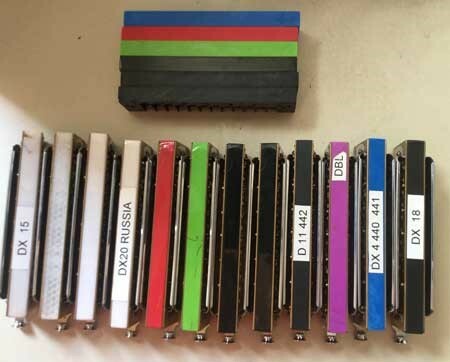 Stock manufactured harmonica combs of all types (diatonic, chromatic etc) are not optimally designed for airflow and top performance. As mass-production items, they involve serious compromises to keep costs down. Most modern chromatic and diatonic combs are made of injection-moulded ABS plastic. 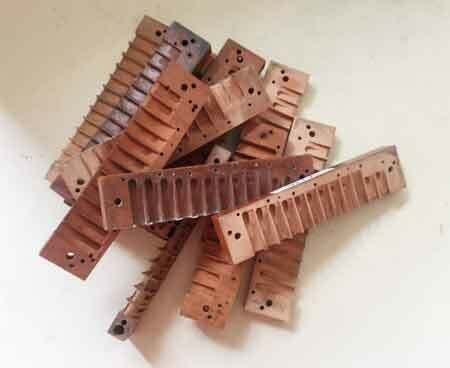 There is nothing wrong with ABS: it is a great material for harmonica combs, non-absorbent, stable, and with similar deformation qualities to wood. 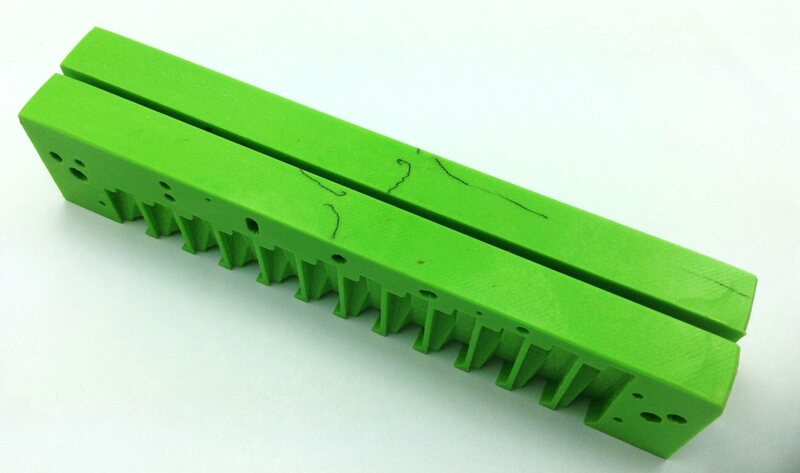 However the process of injection-moulding is not ideal for optimum comb design. To avoid uneven cooling when the comb is released from the mould, the comb partitions need to be kept at a roughly constant thickness. This means that useful thickening and filling of some areas of the comb (especially in the top octave to overcome the effects of Helmholtz Resonance), cannot be done properly with injection-moulding. 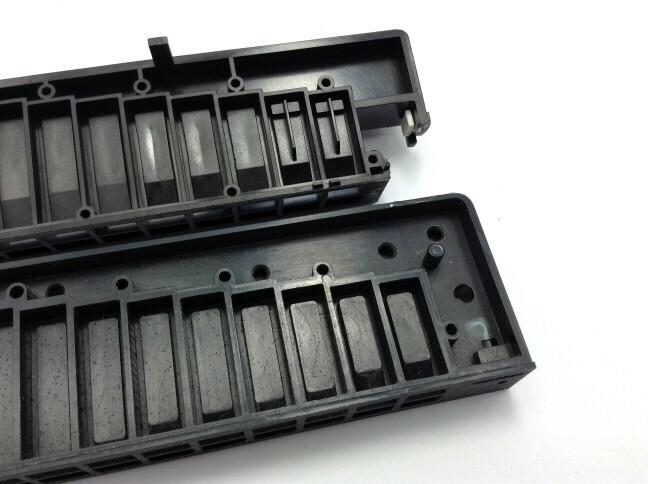 You can see in the photo of two typical stock injection-moulded ABS combs that the raised areas in the higher chambers have to be separated off from the comb walls by a surrounding partition or 'air moat'. That largely defeats their purpose (to reduce chamber volume), but is necessary if the comb is to cool evenly without high and low spots. 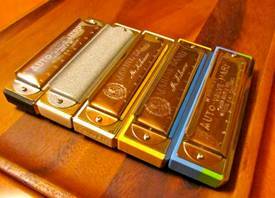 It's an unsatisfying compromise, yet that is how 90% of modern chromatic harmonica combs are made! Players therefore must make do with combs that are a slave to the lowest-cost mass production process - not created with the goal of ultimate reed performance in mind. I am now pioneering a new and, in important respects, BETTER way to make high-performance harmonica combs with ABS plastic: 3D printing. With 3D printing you get all the advantages of ABS plus the ability to shape it into the perfect forms for optimal airflow and small chamber volumes. There are no compromises in the design of my PowerCombs. Each one is aimed at giving every chamber on every comb its best shape and volume to suit the reeds and their pitch. PowerCombs don't just look good, they sound good too. Power by name, Power by nature! You'll be amazed at the difference the optimal chamber profiling makes, especially in the upper octave. The high reeds respond instantly and in perfect tune, without having to overcome the effects of Helmholtz Resonance Coupling (a serious problem on most commercial chroms with injection-moulded ABS plastic combs). There are two versions available - Advanced (single ramped) and Extreme (double ramped). Both reduce chamber volumes significantly to combat Helmholtz Resonance Coupling and improve reed response. The effect of this is especially noticeable in the top holes, where the reeds play more easily and without pitch flattening. The Extreme is theoretically more efficient throughout the range, but in actual playability there is not much between the two types - it's personal preference. Plus you can now add valves to the high reeds for superior response, not advisable with the over-large upper chambers of stock wood or ABS combs. My unique combs are available to buy in six colours for you to fit to your own chromatics, along with screws and detailed fitting instructions. Prices reduce if you buy multiple combs. On some models I offer a pre-fit PowerComb option on a new instrument. 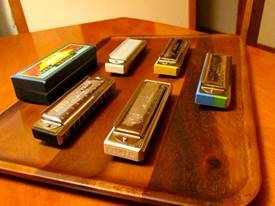 I'm starting with a few iconic Hohner chromatic models, but will soon extend the range to cover other popular brands. Watch this space! Affordable 3D printers have been around for a few years, but there are several reasons they haven't been used for making combs up to now. For one thing there's quite a learning curve involved in understanding the printer's foibles, mastering the variables involved, and working out how to get consistent prints. 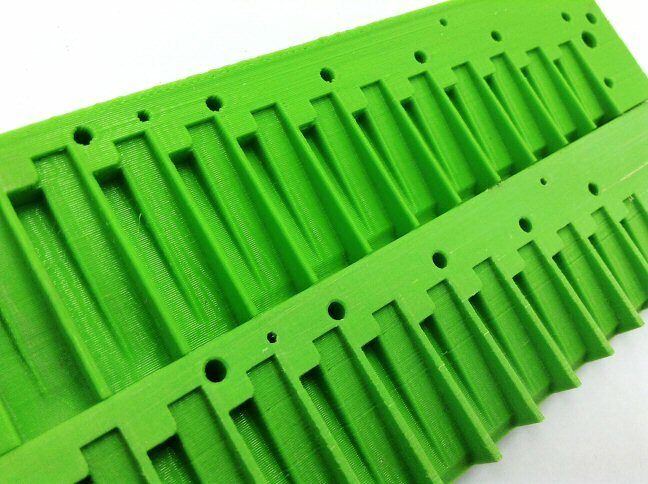 Plus there seemed to be a general opinion that 3D printing could not deliver the accuracy required, and knowledgeable people have said 3D printed combs would not sound good. Happily, they were wrong. My PowerCombs are proving that 3D printing is indeed a viable new way to make these critical parts inside every harmonica. I am sure that other small makers will take up the technology to make custom combs before too long, and it could even be adopted by a big manufacturer if they scaled up the process with many machines working 24/7. I hope that happens! If you're thinking of buying a PowerComb, you should know a little about the way 3D printed combs are made. My printers are the FDM type, which lay down microscopic strands of molten ABS plastic in layers on a heated print bed, slowly building up to make the part. Parts come out with a rippled effect on the outer surfaces, which you can see on the un-sanded sides and internal chambers of my combs. That is normal, and has no effect on airflow or performance. Despite being driven by computer-controlled software, every print comes out slightly different! The main features and dimensions of the design remain the same, but the way the comb sticks to the bed is somewhat unpredictable, as occasionally the ends can lift slightly. If the print is done on a part of the print bed with a small imperfection (an air bubble under the Kapton base tape for example), it will transfer its shape onto the first layer that goes down. Same with small extra strands of plastic at the start of the print, sometimes they get incorporated in the base layer. Occasionally the extruders can clog, or the filament does not feed evenly. Those issues also transfer to the appearance of the final print. Such small variable features can be likened to knot holes in wood, or 'flaws' or 'inclusions' in a precious stone. As with those analogies, I see them as part of the individual personality of each comb, and deliberately leave the back and sides of the comb exactly as they come off the printer. They show the making process, and to me that adds interest and character to each piece. So if your comb has a small indent on the back or some other mark, that's part of its individuality and not something I, or you, should apologise for! It marks your comb as being a one-off, and is part of its nature as a unique 3D printed object. Left to right: sanded comb and unsanded comb (red), sanded comb and unsanded comb (green), random comb inclusions. 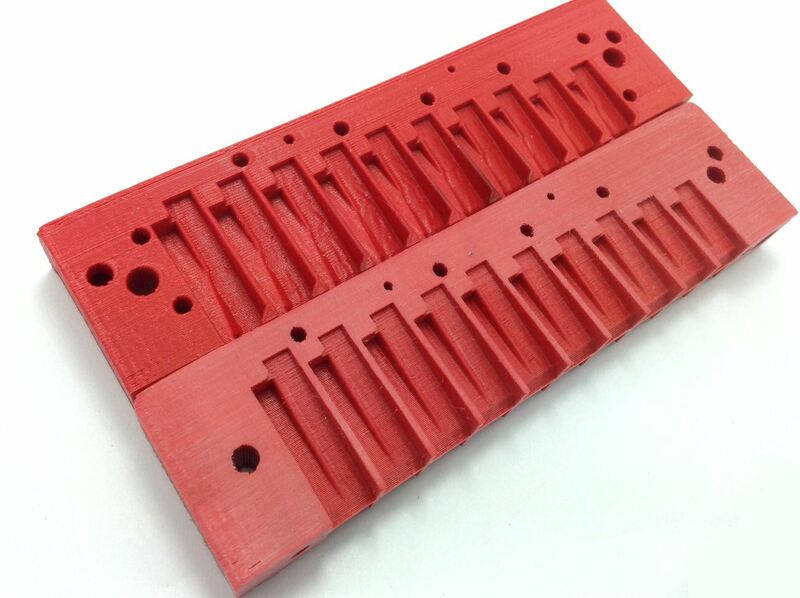 These are not mass-produced identical parts, like injection-moulded harmonica combs; there is a lot of attention put into the finishing process too. After printing, each comb is flat sanded by hand on the all-important reedplate and mouthpiece mating surfaces: top, bottom and front. That imparts a genuine hand-craft element, and gives extra individual personality to each comb. Sanding ABS is much like sanding wood (they have a similar consistency), and it's really satisfying when the print ripples are sanded out and the mating surfaces come out crisp and smooth. Even though each side of the comb is flat-sanded on glass, some combs will have an inbuilt slight curve to them, concave on one side, convex on the other. That does not affect performance; as the surfaces are flat sanded when pressed down on the glass, when the reedplates are attached they will mate with a perfect airtight seal. I hope that helps you understand a bit better how my 3d printed PowerCombs are made, and the vagaries of the process. They look different to commercial combs and, if you are someone for whom perfect outward appearance matters more than performance, then a PowerComb might not be for you. In that case please don't order (or if you do, don't complain about cosmetic issues, as you have been fully advised on this page). I only send out combs that will make your harmonica work better - that's my priority. If that's what you're after too, then please check out the range!